Figure 4-43. - Typical forced warm-air control system. Limit Control. - The limit control is a device that responds to changes in air temperature (in a warm-air heating system), to changes in water temperature (in a hot-water heating system), and to changes in steam pressure (in a steam-heating system). The limit control has two distinct functions. The first function is to control the operation of the fire so the temperature and pressure of the heating plant never exceeds safe operating limits. This function is distinctly for safety control. The second function of the limit control is to limit the temperature and pressure of the heating system for better temperature regulation in the building. 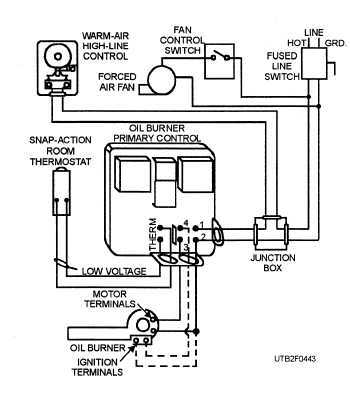 This function is particularly useful in controlling coal-fired heating systems where the coal bed continues to give off heat when the stoker motor stops. By lowering the setting of the limit control, however, it is possible to prevent an excessively hot fire that would continue to throw off excessive amounts of heat after the thermostat has been satisfied. Temperature-Responsive Devices. - Many automatic control units, such as the thermostat, limit control, fan control, and many others, must respond to temperature changes. 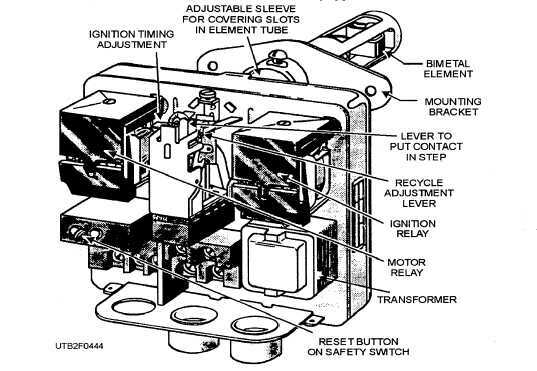 Actually, these are the instruments that use a temperature change to cause the electrical contacts inside each unit to open and close. The opening and closing is an indicating signal that is transmitted to the primary control for specific action, such as starting or stopping the operation of the heating plant. Figure 4-44. - Interior view of a primary control.